Phew! Good thing I decided to sit on the sidelines with this one as the FOMC surprised the markets with another round of easing. As it turns out, Big Ben and his men aren’t too giddy about U.S. economic prospects as they decided to inject more liquidity into their monetary system – to the tune of $40 billion a month! Although most market watchers already saw this coming and priced in their expectations, the Greenback still sold off heavily after the announcement, pushing NZD/USD past the .8200-.8250 resistance I marked. As I mentioned in my trade plan, I was going to play this event very carefully and refrain from entering any orders if the FOMC announces QE3. Although I’m a bit bummed out by the fact that I wasn’t able to catch any pips this week, I’m pretty happy with my decision to be cautious with a major market catalyst coming up. That’s all I got for now as I try to review the FOMC decision and its potential impact on the forex market in the coming weeks. Got any thoughts you’d like to share? Hit me up! Long time no trade, folks. After taking day trades and short swing trades, I’m trying my hand at a long-term trade! One of the comdoll pairs that really stood out this morning is NZD/USD, which is near the .8250 handle. The psychological level is already a good enough reason to short, but upon closer inspection I also saw that the level has been a solid resistance SINCE EARLY MARCH. And as if the strong resistance level wasn’t enough to give me the confidence to short, I also spotted a potential bearish divergence and a possible overbought stochastic signal! Since the pair is near the .8250 level, I’m looking at current events for direction. The latest RBNZ decision turned out to be a snoozer, as the central bank kept its rates steady and showed no rush to hike its rates. I think that QE3 is unlikely this month as there isn’t enough urgency to warrant more stimulus. It’s more likely that the Fed is saving up its bullets for the fiscal cliff ahead. Even if the Fed launches QE3 today, there’s always a chance that the move is already priced in. I’ll be careful though, as I could also be underestimating the risk appetite in markets right now. 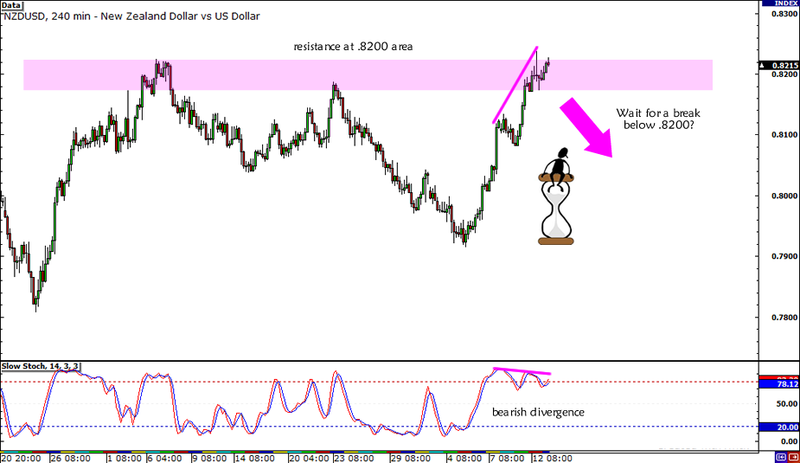 My plan is to wait for NZD/USD drop below .8200 and stochastic to show signs of going down. I’m thinking of placing a 50-pip initial stop loss and maybe add every hundred or so pips until the .7900 major psychological level near last week’s high low. What do you think? Will .8200 hold this week? Please let me know if you have ideas on how to improve my trading plan!